Superhero Twilight loves to write! Poetry, essays, articles… you name it and she can make it fun and easy for your girls. 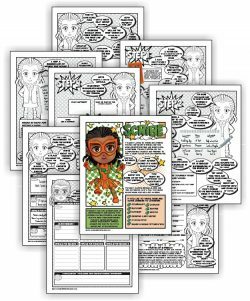 Twilight will guide your troop through completing the Junior Scribe badge with step-by-step instructions they can complete without needing help from you! She even has some career ideas your girls can think about and two-word games to help keep their interest. 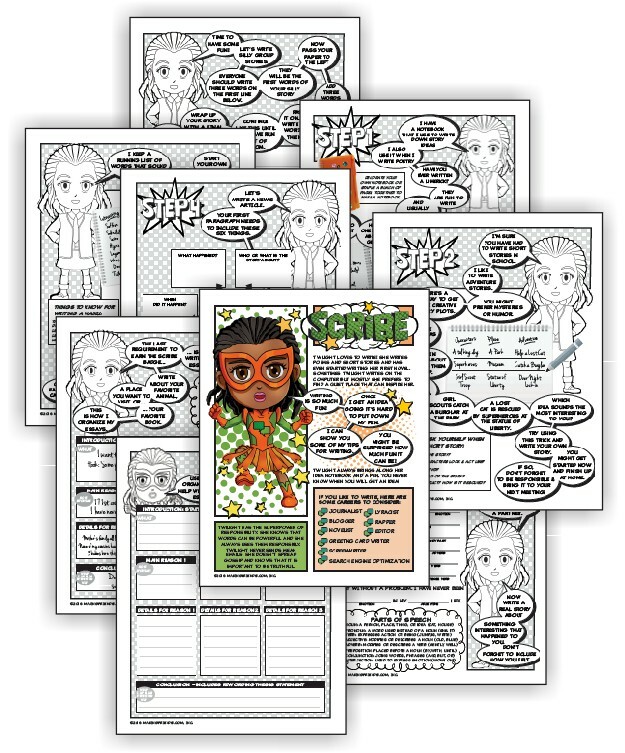 10 reviews for "Superhero Scribe Download"
My troop LOVED this. I had a few that like to write and wanted the badge and others that had no desire to earn it. When I showed them the scribe worksheets, every single one wanted to earn the badge! I think writing is so important and I am so happy that you have created a product that makes these girls excited to write. Thank you! Kudos to MakingFriends.com! My Junior scouts enjoyed using this packet to earn their Scribe badge. Equal parts silliness (Mad Lib, Creating a Group Story) mixed with creativity (Making a Journal, Limireck & Haiku, News Report, Writing an Essay). Scouts who could not attend the meetings could easily complete the requirements on their own with this packet. Highly recommended! Not only an enticing looking packet it but had every aspect to hold the girl’s attention: silliness, creativity, team work & ability to create something truly theirs. My girls had a blast! We giggled, shared & created an atmosphere of learning is fun. Thanks you! The girls had a great time making journals and doing the mad lib. The packet was made in a way to look very cute for girls of this age. Would like more suggestions for active fun things to do so it is less like school. So helpful for leaders! The scribe badge didn’t seem to enticing to me, as I try to make Scouts NOT like school and I didn’t want to make the girls sit down and write. I spend hours trying to make badge work fun for my troop and this saved me SO much time. I was basically able to print and go to my meeting. What more could a leader ask for?! The girls had fun leading each other, instead of me explaining what they needed to do, they were able to read it and understand it on their own. I had a few girls that had more fun talking about ideas for their poems and stories instead of actually writing them but that is part of what makes Scouts fun for them. If you are short on time and ideas, and don’t like to reinvent the wheel, I highly recommend! I have known about making friends.com for a while but have not wanted to spend the $. I know others that have used it and loved it. I decided to give it a try with the Jr scribe thinking that if they could get these girls to enjoy this badge then it would be worth every dime. My girls LOVED it. They were engaged and after 2 hours had to be forced to stop writing and go home. One girl asked “where has this been my whole life, why are we just now getting to do this”. We will defiantly be purchasing all of the daisy-junior curriculum in the near future!!! My girls at first did not like the idea of this badge because of all the writing. In the end they had fun working on it. they liked the Superhero theme. They also loved doing the Mad Lib. It was quite funny listening to what the girls came up with as they each wrote a sentence then passed it to the next person to add on to the sentence. Then they chose writing the article about their investiture/rededication ceremony which they were planning at the same time. The only thing they did not want to do was writing the essay. But I told theme they could do that at home on their own pace. Some of the girls want to do the Scribe badge and some no so excited, but using this material was so help full and everybody enjoy it!!! They really learn and have fun doing this badge. And it is so easy to complete it at home when a girl couldn’t attend to the meeting. Thank you! Thank you so much for offering this download! For meeting prep, I separated basic spiral notebooks into 5 sections with washitape folded on the side for tab dividers. 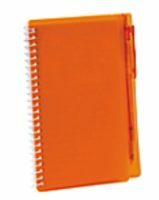 On the first page of each notebook section, I wrote the step and which section of the “guide” to look at for more instruction. During our Scribe meeting, I invited a local children’s book author to come in and talk to the girls about the writing process, then sent the girls home with the Superhero download and the notebooks to finish independently. Some girls have really worked hard to earn the badge, while others were not as interested. My only suggestion, would be to add page numbers, to make referring to specific parts of the guide easier for the girls. Again, thank you so much for offering this download. It really made what could have been a difficult badge for a non-teacher to lead, into something manageable and fun! I look forward to using your other downloads in the future!